What I forgot was … time-consuming. Classes here at the Institute for Genealogical and Historical Research (IGHR) at Samford University in Birmingham, Alabama, start at 8 a.m. They’re immersive — you’re really focusing on trying to absorb all the new information being thrown your way at a fast and furious pace. And with the evening sessions — I’m speaking each of the regular evening-session evenings, with The Ethical Genealogist Monday night, A Family For Isabella last night and The ABCs of DNA tonight — the days aren’t over until after 7 p.m. There aren’t enough hours in the days. So … two quick new resources — new to me, at least. First, from course coordinator J. Mark Lowe, CG, comes the Historical Census Browser at the University of Virginia Library website. This is a totally cool way to display graphically the demographics of the United States as a whole or any part of it over time. There are lots of ways to use this. For example, you could create maps of just one state and watch the population density change from census to census. Go on and play with it. It’s terrific. 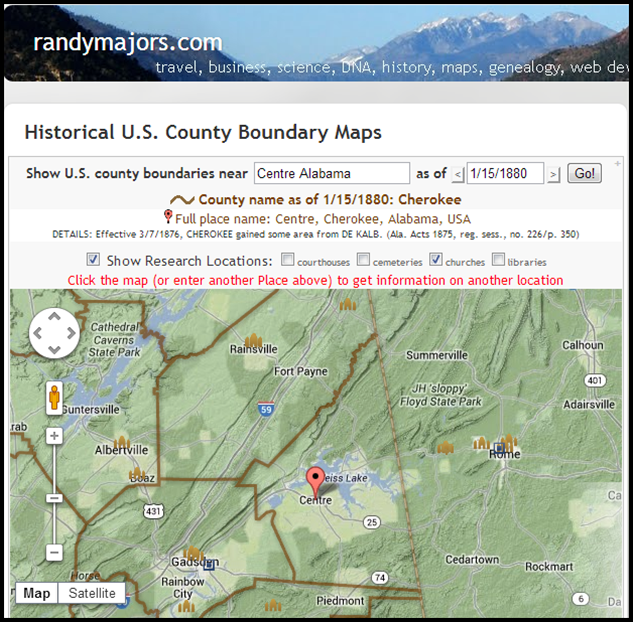 And from instructor Michael Hait comes this link to the Randy Majors version of Historical U.S. County Boundary Maps where you can see the historical county lines overlaying a Google Maps image of any location you choose, and you can add in the courthouses, churches, cemeteries and libraries in the area if you choose. Here’s an example for the town of Centre, in Cherokee County, Alabama, from which a number of my ancestors hailed. I sure hope the mapping is incomplete. I’d hate to think there weren’t any churches or cemeteries in Cherokee County as of 1880! Again, go ahead and play with it. You may find out all kinds of neat things about the places you — or your ancestors — called home. Judy, thank you so much for sharing these two great websites. I hope you have fun and learn even MORE than you already know from IGHR. Too bad it’s a little warm and humid. “Warm” is not a word I would use, Paul. “Hot” is more like it! Fabulous! 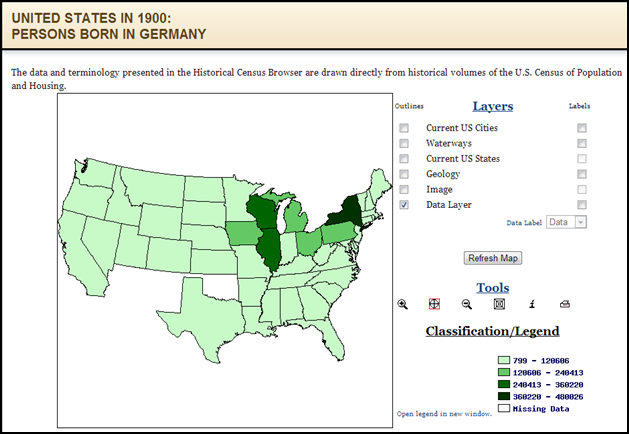 I had one, but not the other, so my Genealogical Map Resources links is getting bigger and bigger and … Thanks so much – Enjoy your time at the Institute. Thanks, Celia! This is the sort of thing that institutes are really wonderful for! Thanks for sharing these maps! I am enjoying your sessions at IGHR! I’m enjoying them, too, Colleen, and am glad to share these few tidbits! Had not seen these features before. Neat. Thank you for sharing this information. You’re welcome! Now I want to emphasize: these are only the smallest snippets of what you learn at an institute! Every serious genealogist should go (and I guarantee you if you go once you’ll want to go back for other classes! ).